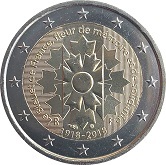 The coin commemorates the 100th anniversary of the establishment of the cornflower (“Bleuet de France”) as the symbol of remembrance and solidarity in France. It started as a means of helping injured veterans of the First World War, but before long had been adopted by the whole French nation as a symbol of gratitude for the sacrifices the soldiers had made to defend their country and their ideals. The design features the cornflower in the centre of the coin. It is surrounded by the words ‘Le Bleuet de France, fleur de mémoire et de solidarité’ (Bleuet of France, flower of remembrance and solidarity). Two vertical lines run from the top of the inner circle, before and after twelve o'clock, to the bottom of the inner circle, effectively dividing the coin into three segments. This represents the French flagas according to the heraldic rules of tinging: left horizontal hatching = blue, middle smooth = white, right vertical hatching = red. At the bottom of the inner circle(six o'clock) are the dates 1918-2018 and just above there the mint mark and the mark of the mint master. Under the corn Flower to the left and right of the middle segment are the letters "R" and "F", these together being the country designatio for France. Return from French Commemorative 2018 to euro coin collector.